The Invite Users plugin allows you to invite users to your blog or site so that you don’t need to manually create their accounts or add them as users. Invite Users plugin is a CampusPress only plugin. It is automatically activated on Edublogs. 1. Go to Users > Invite Users in your dashboard. 2. Add some text for your invite code. Keep it short. 3. Select the default role of the users. If you are using My Class you select the default role Student. You can always change roles later and can create different codes for different permission levels. 4. Decide if you want the user to be prompted to create their own blog during the sign up process if they don’t already have one. 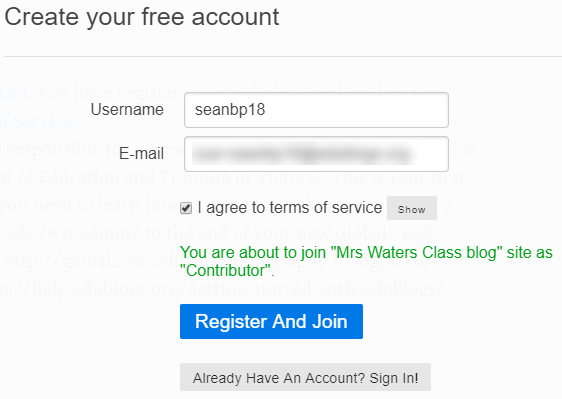 Select ‘Allow users to create a blog in the process’ if you are using My Class and want your students to create their own blog while signing up for their account. 5. 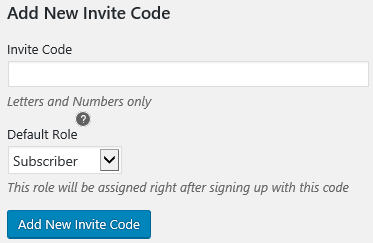 Click the Add New Invite Code button. 6. You will now see an Invite Link. The code has some numbers added to the front to ensure it is unique for your blog. Share the Invite link with those you want to invite to your blog. Visit the Invite link by clicking on the link or pasting the URL into your web browser. Click on Already have an account? Sign In! if you have an existing user account. This redirects to the login page where you’ll be logged into your account and automatically added as a user to the blog. 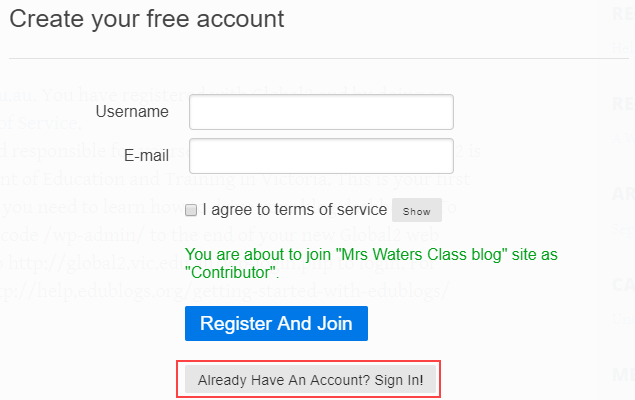 If you are logged into your account before visiting the Invite link you’ll see Join Blog screen and need to click on Join. As a new user you will be promoted to create an account before being added. Enter your username, email address and click Register and Join. 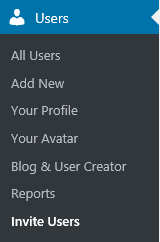 an option to create a blog or a username only (if selected allow users to create a blog). Registration options control blog and user registration on CampusPress networks and are set by the support team at your educational organization. You won’t see the blog creation options in Users > Invite Users, and can only invite users, if blog and user registration is disabled on your CampusPress network. Invites users need to log into their account first if registration is set to disabled or only logged in users may register new sites and you will see a Sign In link when you visit the Invite link. Clicking on Sign in redirects to the Login screen. You will see a blue button and a ‘Guest Login here’ on the Login Screen which provides an option to log in with your School Username if your CampusPress network is set up to allow you to log in with your University or School username and password. Your new user account is automatically created if you click on the blue button to log in with your School username and password.